Corinthian square and rectangular thin veneer covers the walls of the dining space in this Readfield, ME home. Project by Elwell's Masonry. The use of stone in your interior spaces is warm and inviting. 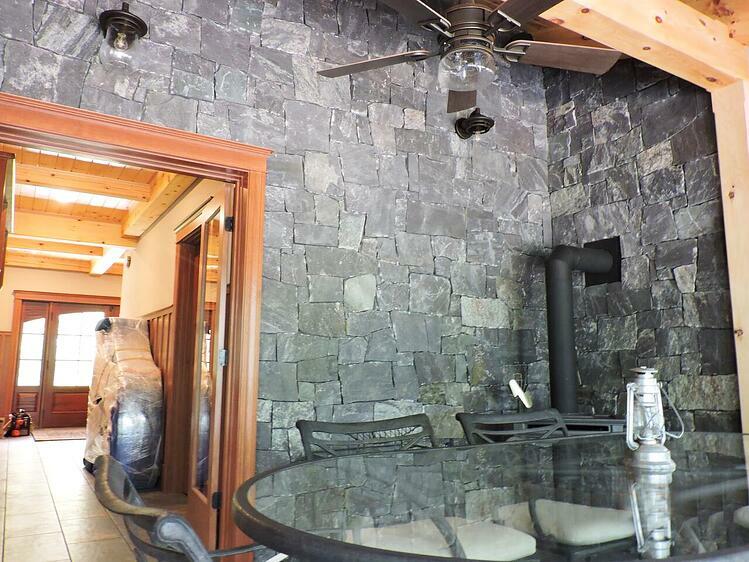 Covering the walls with stone will add texture, color and dimension to the room. This building material can fit right into any decorating style, from modern to rustic. Stone can also be used to cover unwanted interior brick or masonry. If the idea of an entire room covered in stone is a bit too much, a stone accent wall can also enhance any space, including bathrooms, entryways, living rooms, kitchens and dining rooms. 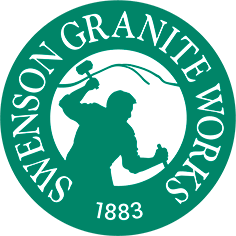 Swenson stocks natural stone thin veneers that can be installed on most surfaces including sheetrock, greenboard, brick and concrete. Granite, quartzite and fieldstone veneers are available in a variety of colors, shapes and sizes. This material is much lighter than traditional full-bed veneer, saving you on labor cost. Once thin stone veneer is installed there is virtually no maintenance — it will never need to be retouched or repainted. Stone veneer also increases the resale value of your home. With a high return of 97.1% in 2018, stone veneer projects have the second highest ROI for a remodeling project. OUR THIN VENEER INSTALLATION GUIDE OFFERS DETAILED INSTRUCTIONS AND DIAGRAMS FOR EACH TYPE OF SURFACE. Open shelving can increase your storage options, or serve as a way dress up your kitchen with decor. 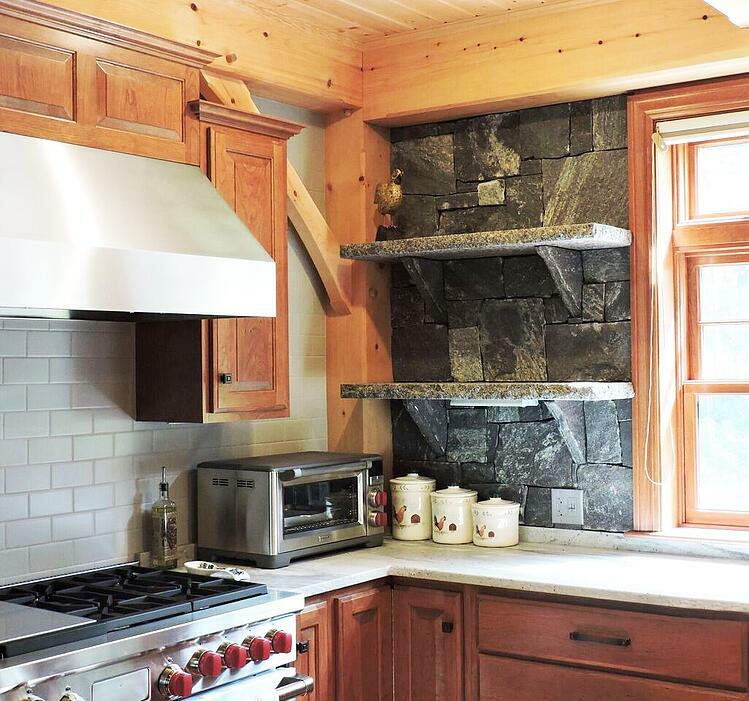 Granite shelves are as beautiful as they are functional and can add an instant "wow” factor to your space. Lori May of Lori May Interiors says that open shelving works best in two situations: for daily-use items or for collections that you want to display. In the above photo, the shelves are Caledonia granite with a thermal finish on the top and bottom, and the exposed edges are rock face. The pieces are roughly 2” thick, and are partially embedded into the thin veneer wall behind. There is pinning into support studs, epoxy, and mortar involved in supporting these shelves with the stone corbels shown, all for safety. The walls behind the shelves are Corinthian granite square and rectangular thin veneer. The kitchen island is often the hub of the home, making it an important design feature and a great place to add personality to your kitchen. 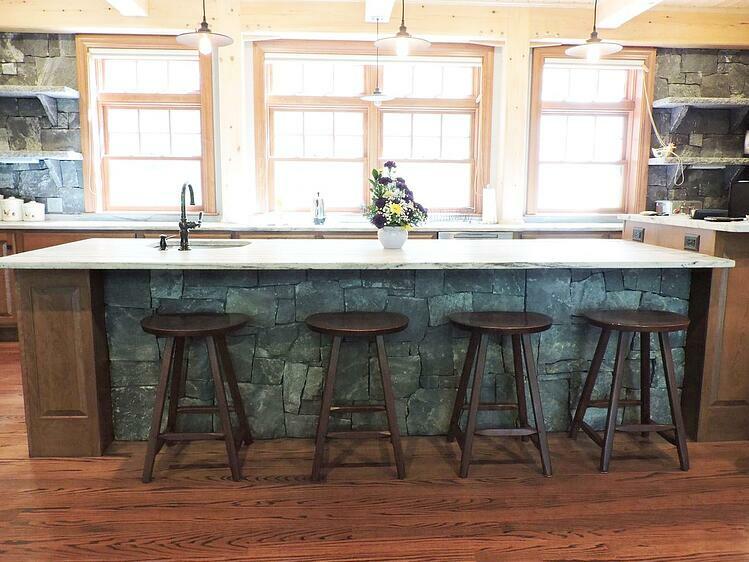 A natural stone kitchen island can add character, texture and warmth to the space. Corinthian granite square and rectangular thin veneer was used for the stone facing on this kitchen island. 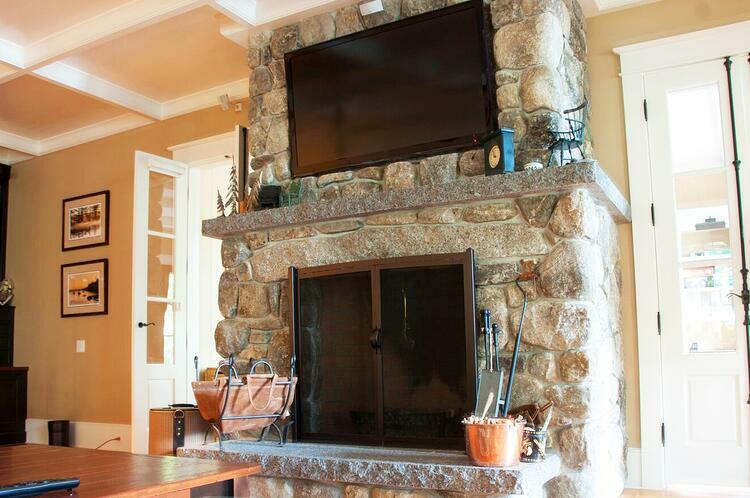 The living room fireplace in this Lake Winnipesaukee home has a Caledonia granite hearth and mantel. A fireplace in your living room can really add a whole new dimension to your home. Whether rustic, traditional, contemporary or minimalist, a natural stone fireplace can fit in perfectly with any interior style. With a natural stone fireplace, there is no need to worry about chipping or cracking over time — like there is with painted brick. Homeowners are opting for stone veneer, and granite hearths, mantels and surrounds — the most elegant, durable, and efficient material around — to create a stunning focal point for their living rooms. Swenson stocks some common sizes of hearths and mantels, all in Woodbury Gray granite, with a thermal top and split face on four sides. Hearths, mantels, and fireplace surrounds can be custom produced in seven granite choices and many finish types, including sandblast, thermal, honed, polished, split face, rock face, and bush hammered. As part of the custom process, Swenson will use your exact template to create the desired shape and design you have envisioned. Edge effects include half bullnose, full bullnose, bevels, radius corners, and more. Custom ordered granite corbels are a beautiful way to support your granite mantel. 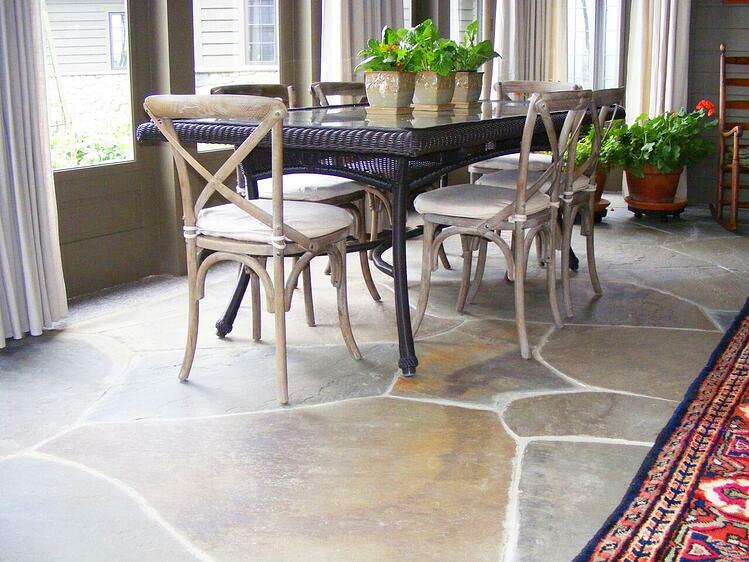 Irregular bluestone pavers add warmth and rustic New England charm to this dining room. Bluestone is an excellent choice for flooring as it contributes texture and richness to your interior. You can choose to have the pavers extend from the exterior into the kitchen or dining room, which is a nice way to unify the space. Thermal bluestone also works beautifully for bathroom floors, and even walls, because it is non-slip and has water-resistant properties. 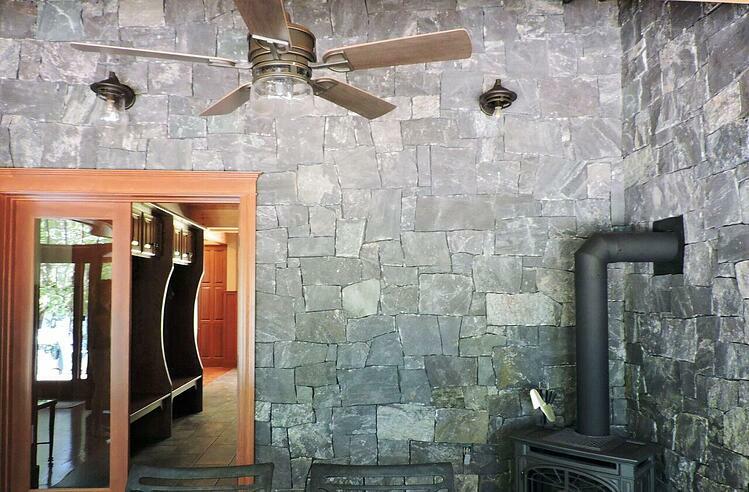 Feeling inspired to add character to your own home’s interior with the beauty of natural stone?  Visit a Swenson Granite Works store nearest to you and our team can help make your ideas come to life. Our thin veneer spec sheet will give you options for stone types, shapes, sizes, colors and textures. Download it here.